A couple years ago I wrote 10 tips for assessing students. Since then I have thought of 10 more tips, so here you are! Schedule students: if you're giving oral exams, don't just tell the whole class to show up at 9am. Give them a specific time. That way they won't waste time waiting nor will they make tons of noise in the hallway. Have a waiting room: it's annoying for both the teacher and the student when other students are in the hallway making noise. Bring exta materials: white out, pens, pencils, and erasers. 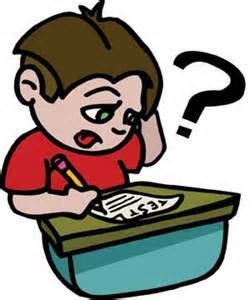 Have different exams: give exam A to one row of students and exam B to another row. It'll cut down on cheating. Use rubrics: especially if you have a subjective exam. Walk around the room: before you give the test make sure there are no answers on the desk, walls, chairs, etc. Walk around during the exam to cut down on cheating and afterwards to make sure no one forgot anything. Have a place for their stuff: since backpacks, coats, books, etc aren't allowed at desks you need to provide a space where students can put them. Don't use names: if you have a subjective test you might favour students you know. Have them use their student ID instead. Write new tests: don't re-use old tests, you're just asking for trouble. Make sure students leave: there's no reason they need to linger outside the classroom when they finish. If they want to wait, send them to the waiting room.